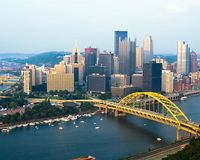 Last week, I had the pleasure of spending four days in the beautiful city of Pittsburgh for the annual Oral History Association conference. This year's theme, "A Convergence of Interests: Oral History in the Digital Age," was especially relevant to much of our work at Densho, and I was privileged to deliver a presentation to share some of what we have learned about using technology to enhance what we do. My talk, "Making Sense of Metadata: A Practical Overview for Oral Historians," was a broad (and brief!) introduction to basic concepts about metadata and how it relates to an oral history project like Densho. For those not familiar with the term metadata it is often described as, "data about data." Arlene Taylor provides the slightly less ambiguous definition: “...structured information that describes the attributes of an information package for the purpose of identification, discovery and management” (Taylor 2004). In our case an information package is the group of digital files, including video, transcript, narrator biography, and images, that make up a Densho visual history (and, of course, our historic photographs, documents and other materials). Metadata is all of the information that we record to keep track of these digital objects. While you may not realize it (unless you are a librarian or information architect), you benefit from Densho's metadata every time you use the Densho Digital Archive website. When you navigate by topic, filter a list of search results by date, or view a video segment with its text transcript, you are using the descriptive, administrative and structural metadata we have created. Metadata is also extremely important to our long-term archival and preservation strategy. It provides the documentation and provenance that will allow the digital materials in the archive to exist far into the future.